The Honda CR-V is a compact crossover that has been a leader in its segment for years and is now in its fourth generation. It’s America’s best-selling SUV for the past decade and was substantially refreshed for the 2015 model year. AS a result, the 2015 CR-V was named Motor Trend’s 2015 Sport/Utility of the Year. So we knew we had a well-received vehicle on our hands when we tested the new CR-V recently for a week. We also had the all-new Touring trim model loaded with extra features like the leather interior and moonroof, and after a week in the vehicle, we can safely say it lived up to its reputation. Honda called it a major-minor model change. 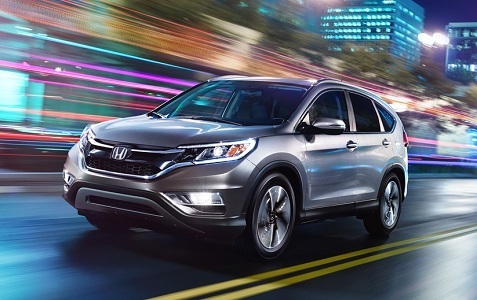 The automaker increased the fuel economy and added another trim line to the 2015 Honda CR-V, but they also improved their best-selling entry level crossover vehicle in 60 other areas. 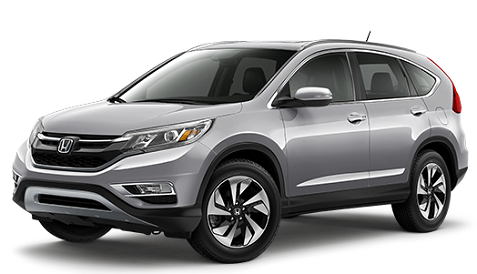 For 2015, the Honda CR-V has a new grille, new headlights, new front bumper, new skid plate and a tweaked front suspension. The rear end has a new fascia, new license housing and new bumper. It looks wider from the rear and now the crossover can be equipped with 18-inch wheels, in addition to its normal 17-inch rubber. LED running lights are also available, a power tailgate is now offered and there is an available smart key. The interior has gone high tech too. It has dual information screens. The center console is configurable, with easily reachable USB ports and the abilityto hold an iPad and large soft drink cups from fast food outlets. The dash has a clean saddle bag look to it as each soft touch layer flows down to a thin wood-like trim that spans across its width. 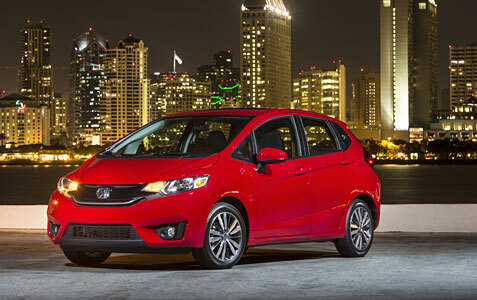 The Honda Fit EX-L is larger for 2015, and somehow added more power while also increasing fuel efficiency. We took the Fit for a one-week spin to find out how great a compact car can be these days. Prices start at around $16,000, but can climb significantly when adding features and moving up trim levels. When Honda took to redesigning the Fit, you can quickly see that style was going to play a large role in the new car. The new Fit sports a fresh and dynamic exterior design with slimmer headlights that integrate into a solid grille design and an aggressive lower intake. Chiseled sides emphasize the wheels and the dynamically tapered roofline that terminates in a color-matched spoiler. Eight colors, including several new and vibrant options, accentuate the fresh exterior styling. From some views, the 2015 Honda Fit EX-L can resemble a shrunken minivan, but when you are reaching for practicality, there is only so much room to thread the needle in regards to design. Inside, the increased interior room and visibility create a sense of airy spaciousness, which is complemented by upgraded, soft-touch materials that raise the feeling of quality. The rich and sophisticated black with silver accented design of the interior surfaces and controls, and blue backlit instrument dials, are stylish and functional. The available Display Audio touchscreen interface and first-ever leather seating (on EX-L models) further increase the premium feel of this new Fit. New standard features on all Fit models include auto on-off headlights, LED brake lights, Bluetooth HandsFreeLink and a center storage console with armrest. Items such as Smart Entry Push Button Start, a one-touch operated moonroof, 7-inch touchscreen Display Audio with next-generation HondaLink, and heated leather seats are among the upgrades available for the first time in Fit. We did find the driver seat to have relatively limited room to slide back to make room for taller drivers. There is also a feeling of tilting into the long windshield where you get that minivan feeling, and not in a good way. Honda didn’t hold back when redesigning the 2014 Odyssey, which would have been a safe play, but instead swung for the fences in design and function. We had the opportunity to test the striking 2014 Honda Odyssey Touring Elite while taking a long road trip with six adult-sized passengers (including the driver) to find out what this people mover had to offer. Honda reinforced and expanded upon the vehicle’s already great features, including the exceptional value for money that already defines the Odyssey for its target buyer, which is Gen X and Gen Y families. 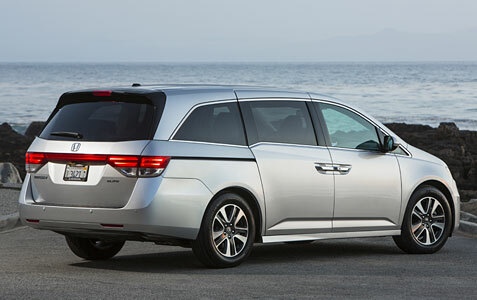 Refined and youthful, sporty and advanced, the Odyssey’s refreshed styling adds new premium elements for 2014. The 2014 Odyssey features sleeker, more sophisticated exterior styling with a new, more deeply sculpted aluminum hood, new aluminum front fenders, a new bolder twin-bar grille and a revised lower front fascia with integrated chrome-trimmed fog lights. New two-tone mirror housings, darker-finish projector-beam headlight housings, LED taillight bars and new badging add to the 2014 Odyssey’s premium look. Other notable exterior highlights include new black-trimmed headlights, new available fog lights and black-surround grille for an upscale appearance. New body-color matched side mirrors and additional bright chrome trim add to the premium appearance. New rear styling and LED taillights with clear lenses and eye-catching perimeter “light pipes” add to the polished look. Weight savings come from the use of aluminum for the hood, front fenders and front suspension lower control arms. The 2014 Odyssey EX, EX-L, Touring and Touring Elite models have a wiper-linked headlight system that automatically turns on the headlights when the front wipers are activated. In addition, new standard one-touch turn signals improve convenience for the driver when making routine lane changes. With this system, one flick of the turn-signal lever provides three blinks of the turn signals – ideal for changing lanes. Pressing the lever past the “click point” provides continuous blinking. A new keyless entry system with push button start on EX, EX-L, Touring and Touring Elite allows the driver to approach the vehicle, open the door and start the engine, all without touching a key. The system only requires the driver have possession of the key fob. The system also simplifies opening the sliding side doors and tailgate; locking all doors when leaving the vehicle requires only touching the lock button on any door handle. We were also impressed with the Odyssey’s power moon roof with tilt feature, 18-inch x 7-inch alloy wheels, blind spot information system, front and rear parking sensors, dual power sliding doors, power tailgate, expanded view drivers mirror and heated power door mirrors with turn indicators. Together, the 2014 Honda Odyssey Touring Elite has a look all to her own and really doesn’t reveal how much space is inside this modern machine because of the sleek skin and aerodynamic design. There is that “wow’ factor when you first enter the 2014 Honda Odyssey Touring Elite with the enormous amount of cabin space, including the untouchable storage area behind the third-row seating. 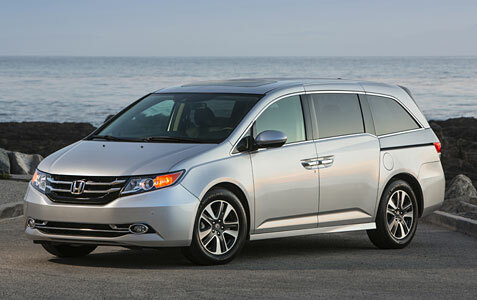 Inside the 2014 Odyssey, new finishes brighten the cabin and an all-new center stack showcases a host of new features. Additional standard technology on the Odyssey Touring Elite brings new levels of ease and connectivity to owners, including keyless Smart Entry with Push Button Start, HD Radio, an SMS text messaging function and HondaLink featuring Aha Mobile interface. HondaLink, which debuted on the 2013 Honda Accord, enables Odyssey owners to connect quickly and easily to a wealth of cloud-based content. The free HondaLink smartphone app uses the owner’s favorite online content to create live, personalized radio stations, allowing drivers to put away their phones and hear updates and news feeds, as well as check out restaurant reviews. Fans of the wildly popular Honda Accord now have another option with the all-new Accord Hybrid. Car buyers looking for hybrids and/or high gas mileage cars now have another excellent option as well. I traveled to central Ohio for the opportunity to drive this new vehicle and also for a tour of the Marysville, Ohio plant where the Accord Hybrid is built. The styling for the Accord has remained elegant through this ninth generation without becoming boring. The vehicle has been a force in the midsized market for so long that the bar is set very high, and the current Accord upholds that standard. 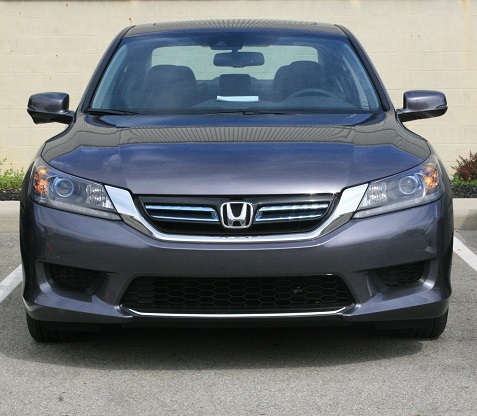 The Accord Hybrid has a number of design accents that set it apart from the gas version, including a blue-accented upper grille on the front end along with blue-accented headlights, blue-accented LED taillights and a trunk lid spoiler that helps reduce aerodynamic drag. Along with various hybrid badges it’s enough to give the Accord Hybrid a distinctive look. It also comes with 17-inch aluminum alloy wheels with a sharp design that’s unique to the Hybrid. The Accord Hybrid interior is very similar to other Accord models with a level of comfort and upscale accents that will please most buyers in this segment. It’s roomy and comfortable and all of the instruments are laid out nicely for easy usage. The Hybrid’s interior is distinguished by a black steering wheel and the unique hybrid instrumentation and has features like dual-zone climate control. When you drive the Accord Hybrid, it drives differently than the regular gas model, so there will be an adjustment period as drivers get used to it. It’s not really better or worse – it just feels different. For example, gas cars typically coast when you let up on the gas, while here with the Hybrid you’ll feel some drag as it’s designed to charge the battery in these instances. Also, drivers can monitor mileage and battery usage vs gas usage in real time, so driving efficiently becomes a game if you’re inclined to play. I suspect most buyers will embrace these differences. Still, the acceleration is fine and the overall driving experience is excellent. I drove the Accord Hybrid on a wide variety of roads and found the vehicle to be very responsive. In one of the city setting we were challenged to try to get the highest gas mileage along a prepared route. Once you get the hang of how the Hybrid works you can achieve some very impressive mileage numbers in slow traffic areas. The Accord Hybrid achieves impressive fuel economy ratings with 50 MPG city, 45 MPG highway and 47 MPG combined by using a two-motor hybrid system called Intelligent Multi-Mode Drive (i-MMD) that continuously cycles between three different modes (EV drive, hybrid drive and engine drive) to maximize fuel efficiency. The gas engine powers a generator in most driving conditions which then provides energy to charge the hybrid battery and/or for the electric motor to power the wheels. The i-MMD can also operate on gasoline engine power only, usually during medium- to high-speed cruising. Pricing for the Accord Hybrid ranges from $29,155 for the base Hybrid, $31,905 for the Hybrid EX-L and $34,905 for the Hybrid Touring. An Accord plug-in hybrid is also available which has a smaller battery. If you’re thinking about buying an Accord or if you’re in the market for a hybrid, I strongly recommend driving the new Accord Hybrid and having a sales representative spend some time with you explaining all the features.